San Luis Obispo has some of the best boutiques to find the perfect gift for everyone on your list. There are some things that big brand stores just don’t have, so why not shop small for the holidays? San Luis Obispo is once again joining the American Express campaign, “Small Business Saturday,” to celebrate and support our local shops. 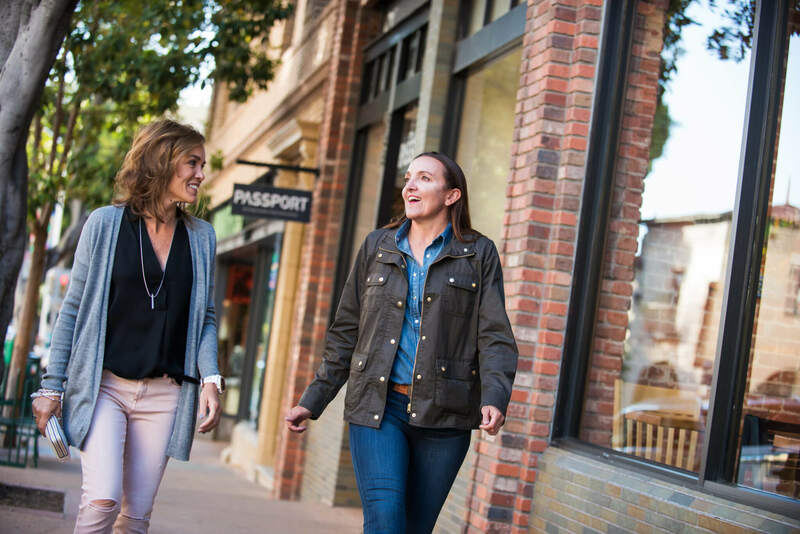 This event encourages shoppers to get out and support the stores and restaurants that make SLO’s shopping scene and cuisine options unlike any other. SLO Transit is even offering free bus services to get you to and from your shopping excursion—no excuses. Below is a roundup of some of our favorite Downtown SLO shops to help you get your Christmas shopping done. Who knew that so many different kinds of socks existed? At The Sock Drawer, you can get socks covered in Bob Ross’s face, pancakes and even corgis. Find the perfect pair for your friends and family right in the heart of Downtown—it’s something that nearly everyone wears, and the patterns will knock your socks off. Your furry companions are family too, so why not treat them with a present? This local pet boutique carries all you could ever want for your dogs and cats; including collars, leashes, toys and quality pet food. If you feel like making them feel extra special, Tails has pet-friendly baked goods so everyone can enjoy holiday treats. Want to do good for the world? Humankind Fair Trade is a Fair Trade Federation boutique that promotes the support of artisans and farmers in developing countries. You can rest assured knowing that everything you purchase from the shop is eco-friendly, made in ethical working conditions and helping local economies in less fortunate communities. Not to mention, they have beautiful jewelry, accessories and home goods. Fall and winter style is in, guys, so it’s time to update the wardrobe. Passport is perfect for the streetwear-loving man in your life. On top of carrying name brand apparel, accessories and grooming products, they’ve also created their own Passport-brand styles that you can’t get anywhere else. Who’s next in the line-up? Moondoggies Surf Shop with a wide selection of surf and skate gear. This local shop features favorite brands like O’Neill, Billabong and Patagonia. But if you want to get your friends and family something Moondoggies-specific, they have great gift options with their infamous rasta surfer logo, that the locals are always sporting. For over 25 years, Hands Gallery has been providing the community with one-of-a-kind gifts from local artists and craftsmen. If you want to buy your friends and family something SLO-specific and irreplaceable, this is the shop for you. From ceramics to furniture, Hands Gallery showcases the work of artisans of all mediums—there’s something for everyone! Blackwater’s bohemian apparel is perfect for the event or festival-goer in your life. This mother-daughter owned boutique is full of unique handpicked goods. On top of having unique apparel, they sell succulents, jewelry, candles, incense and items for magic. Fromagerie Sophie may not be the first place you think of when it comes to holiday gifts, but their cheese, charcuterie and spreads are sure to wow any party. This Parisian-style cheese shop houses goodies from around the world and is meant to give you the feel of a European fromagerie. As for gifts for others, you can purchase cheese and charcuterie gift club memberships for the gourmand in your life. Even the youngest of children know and love the holiday season. Ecobambino has the perfect natural, eco-friendly necessities for the baby, toddler or young child in your life. They have all of the essentials like burp cloths and sippy cups, as well as puzzles, toys and play mats. Better yet, it’s owned by a local mom with a passion for selecting healthy and safe children’s products. Owner and local jewelry maker Shannon Len has curated a collection of high-quality artisan goods at Len Collective. You’ll find handmade jewelry, natural apothecary and home goods at this unique shop, and it’s full of things you didn’t know you or your friends needed. Go in to buy a present and you might just leave with something for yourself. Shopping for a fashionista who’s always up to date with the latest high-end brands and trends? Ambiance is the store to go to. The recently remodeled SLO location carries apparel, shoes and accessories, with brands like Free People, Mother and Rails. They carry clothing for all occasions, so you can shop for work and play at the same time. Shopping small also comes with a perk when you are shopping in SLO. The Downtown SLO Association is bringing back the “Shop Small Passport,” which allows shoppers to fill up their “passports” with stamps from local businesses for a chance to win a gift basket loaded with gift cards. 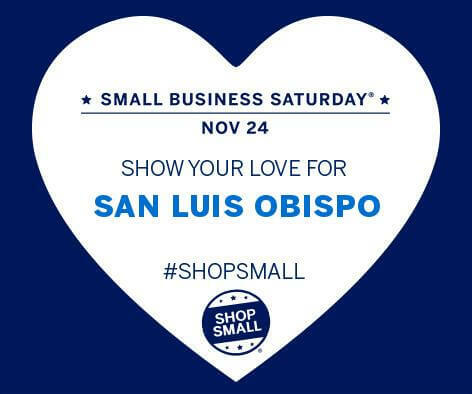 Regardless, it’s important to support your favorite local shops in SLO, so shop small on Saturday, November 24.